It’s really hard to argue with the consensus view of human evolution because there isn’t any consensus. We pity the poor biology teachers who have to teach human evolution. Whose version of evolution should they teach? How can you give a test on human evolution when every answer is right (or wrong) depending upon which expert you ask? Several times in the past we have started to write an article about what evolutionists believe about human evolution, but have given up in frustration because there are just too many different stories to address them all. We wish there were a consensus view that we could discuss. Our solution to the problem is just to consider what evolutionists have written about human evolution since April, 2010. It may not be consensus, but at least it represents the latest confusion in the peer-reviewed scientific literature. The fundamental problem evolutionists have is that they are trying to develop a theory with no real data to back it up. Fortunately for evolutionists, the “fewer fossils that provide detailed information” give them more room for unsubstantiated interpretation. But whether the new hominins are Homo ancestors or a side branch of late-surviving australopithecines, researchers agree that because of their completeness—including a skull and many postcranial bones—the fossils offer vital new clues to a murky area in human evolution. “This is a really remarkable find,” says paleontologist Meave Leakey of the National Museums of Kenya in Nairobi, who thinks it's an australopithecine. “Very lovely specimens,” says biological anthropologist William Kimbel of Arizona State University (ASU), Tempe, who thinks they are Homo. We could review their arguments, but what would be the point? They are trying to find evidence for how humans evolved from apes; but humans didn’t evolve from apes. That’s why they can’t make the evidence fit their theory. National Geographic has been funding research that led to the discovery of a fossil commonly called, “Ardi.” We told you about Ardi in our November and December, 2009, newsletters. National Geographic rehashed its find in the July, 2010, cover story, which ran 34 pages. There was very little of substance in that article. It was mostly an adventure story about how exciting it is to find fossils, accompanied by many excellent photographs. The story included this interesting exchange between the author of the article and Tim White, the UC Berkley paleoanthropologist paid by National Geographic to find and study hominid fossils. I asked White whether Ardi's transitional form might justify calling Ar. ramidus a "missing link." He bristled at the very question. "That term is wrong in so many ways, it's hard to know where to begin," he said. "Worst of all is the implication that at some point there existed something halfway between a chimp and a human. That's a popular misconception that has plagued evolutionary thought from the beginning, and one Ardi should bury, once and for all." So, the connecting link between apes and humans won’t be much like an ape or much like a human. Well, isn’t that convenient! Anything remotely like an ape or a human could be the common ancestor. Ironically, right in the middle of that article, on page 45, they ran this chart. 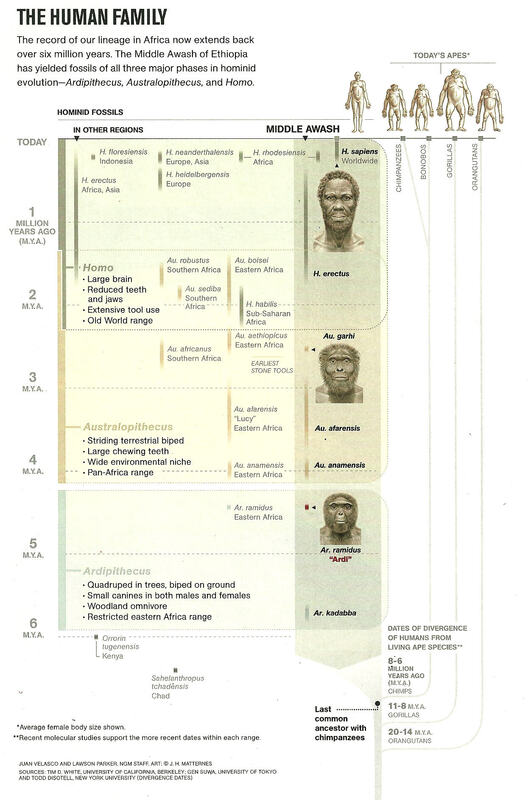 The chart above makes it look like humans evolved along a straight line that goes through Ardipithecus ramidus and Australopithecus afarensis up to H. sapiens (modern man). 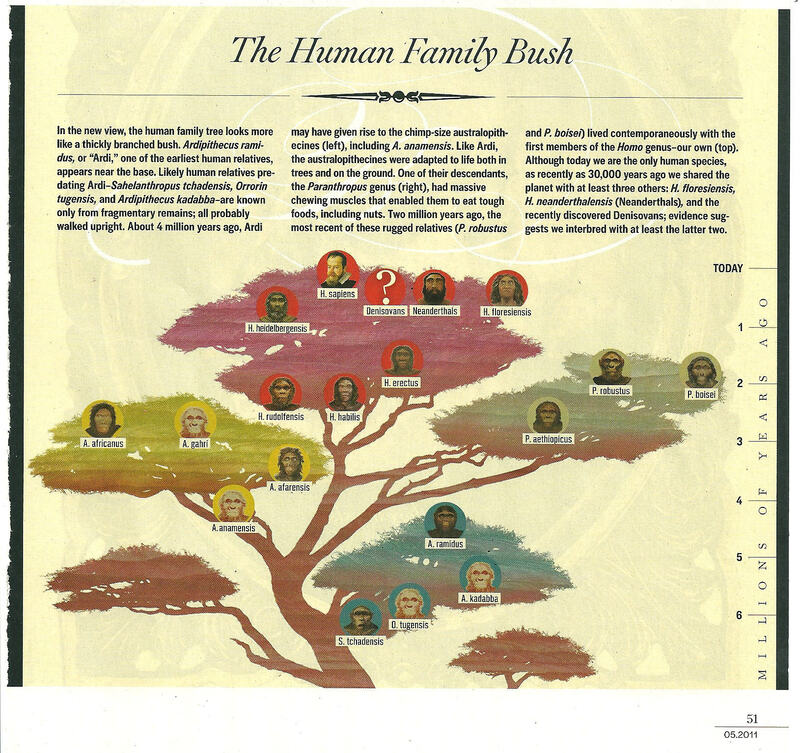 But then Discover magazine published the chart below showing them on completely separate branches that share a common ancestor, but did not evolve into each other. There’s a big question mark above the Denisovans. We will talk about that, later. First, let’s finish up this discussion about the disagreement of who-evolved-into-who. You might not have heard about the Denisovans. The Discover chart shows a big question mark rather than an artist’s conception of what Denisovans looked like. That’s because Denisovans are known from a few bone fragments and a bunch of stone tools. Even the most imaginative artist needs more than that to draw a picture. For the first time a hominin has been described, not from the morphology of its fossilized bones, but from the sequence of its DNA. The DNA comes from a piece of finger bone discovered in Denisova Cave in the Altai Mountains of southern Siberia. This cave was intermittently occupied by humans for 125,000 years. It is rich in stone tools and bone implements, but has yielded few human bones, most of them isolated finds such as that used in this study. With such incomplete specimens, the morphological information needed to identify the species to which a human bone belongs is impossible. It’s hard to believe that this was printed in a prestigious, peer-reviewed journal, and not a supermarket tabloid. Follow-up research was printed in December. It was mostly about the methods and math used to come to their imaginative conclusion. But this comment is of particular interest. Yes, it’s incredible, it’s imaginary, and it’s just what evolutionists wanted, brought to them by Santa Claus. The DNA analysis of this partial finger bone has completely changed the evolutionists’ tune. Evolutionists have been divided as to whether humans evolved in Africa and migrated into Asia and Europe, or the more racially sensitive notion that humans evolved simultaneously all over the eastern hemisphere. They think they can resolve this issue by determining the route the first humans took out of Africa. Most anthropologists think that our species, H. sapiens, first evolved in sub-Saharan Africa about 200,000 years ago and began migrating out of Africa between 70,000 and 50,000 years ago, eventually colonizing the globe. And although the expansion has often been considered a single migration, many researchers are beginning to suspect that moderns left Africa in two or more waves. Some of these early migrants may have gone east, across the Red Sea and along the southern coast of Arabia. But the earliest known modern human fossils outside Africa suggest a northern route, perhaps through the Nile Valley: Modern human skulls and other bones discovered in the early 20th century in the Skhul and Qafzeh caves in Israel are now dated to between 100,000 and 130,000 years ago, although researchers debate whether these early colonizers traveled any farther at that early date (Science, 9 October 2009, p. 224). So ancient DNA, too, argued against the idea of mixing between Neandertals and moderns. Over the years the replacement model became the leading theory, with only a stubborn few, including Wolpoff, holding to multiregionalism. The one thing that evolutionists really do agree upon is that apes and humans had a common ancestor, and a study of differences in human and ape DNA can tell how both evolved. The presumption has always been that, since humans are more highly evolved than apes, human DNA should have things that ape DNA doesn’t. Therefore, they look for the genes that make us human. That theory got a real kick in the head in March. All of the articles about the DNA comparison make the same fundamental error. They all assume that apes and humans evolved from a common ancestor. Therefore, they think, every difference in the DNA is due either to addition or loss of information. If apes and humans didn’t have a common ancestor, then any conclusions based on this assumption are meaningless. This is especially true of the “molecular clock” idea which tries to determine how long it has been since species diverged based on mutation rates and the number of differences.